Digit-Eyes labels can easily be made waterproof! Vera would like Davey to help with the laundry. And Davey would like to know which pair of Dockers is tan and which is blue without having to ask Vera. Davey buys a set of washable vinyl labels from the Digit-Eyes website. Davey gets some safety pins and sticks them through the edges of the vinyl labels. He could sew them down, but he does not feel inclined to do so. Davey, going through his closet with Vera's assistance, for each item, puts a pin with a label someplace inconspicuous on the garment. When he comes home and changes clothes, he simply tosses the garments -- tags and all -- into the wash. Helpful Hint: Not all items need labels all the time. Digit-Eyes labels can be easily re-recorded. A good example is a case where there is one set of towels for the master bath and another one for the guest bath. When removing the towels from the bathroom for washing, simply temporarily attach a Digit-Eyes tag to them, record "master bath" or "guest bath" and toss them in the washing machine. When the towels are done and placed back in the bath, remove the tags and save them for labeling other items. 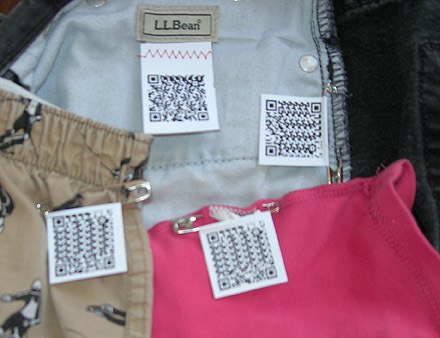 Whether the labels are sewn in or pinned, closet confusion is a thing of the past and Digit-Eyes has done its job!